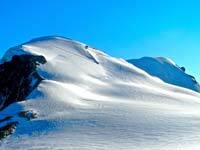 The Val d'Anniviers valley, found just to the west of the Zermatt valley, is accessed by postbus or car from Brig. Offering a more traditional experience to the chic Zermatt, the French-speaking Val d'Anniviers nevertheless offers wonderful scenery, walking and winter sports. 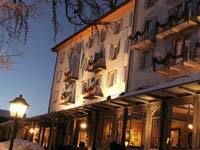 St Luc, a small village about half way up the valley, is the main attraction: it offers the Grand Hotel Bella Tola, a world-class boutique hotel with 32 rooms and a small spa, and great walking in the mountains above (accessed by the Tignousa Gondola). At the end of the valley is found Zinal, a mountain town offering serious walking in the summer and over 70 kilometres of ski pistes in winter. 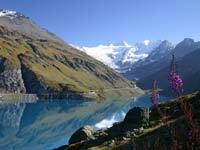 Other attractions include the impressive Moiry Dam and the 5 kilometre-long Moiry Glacier. As small, luxury hotels go, you would be hard pressed to beat the Bella Tola. This family run boutique hotel has 32 prettily furnished rooms, a small but impressive spa, two fine restaurants and a tranquil garden terrace. Oozing character and charm, it is by far and away the best hotel in the Val d'Anniviers (and one of the nicest we have found anywhere in the world). Its wood-beamed lounges and library, for example, contain beautiful antique furniture and paintings, no doubt carefully acquired over this Bella Tola's 150-year history. Its main restaurant, Salon 1900, features a muraled ceiling and walls covered with large antique mirrors. And its spa (with steam room, sauna, ice fountain, fresh water swimming pool and relaxation room) offers stunning views over the lush valley below and the snow-capped peaks of the 4000-metre high mountains that are found at the valley's end. The hotel has a range of rooms to cater for various budgets, though we recommend a south facing room with a balcony. Most guests take the half-board option: dinner comprises a five-course feast, with classical French cooking mixed with local produce. The hotel also plays host to a number of concerts and local celebrations throughout the year. when? June to October (summer season) and December to March (winter season) are the best times to visit. £$€¥ South side double rooms with a balcony start at CHF 200 per person per night. St Luc, a small village on the east side of the val d"Anniviers, is a good place to stay if you have come to walk. From here, it is best to take the funicular railway from the south end of St Luc (1684 m) to Tignousa (2178 m) in order to get above the tree line. Tignousa is the starting point for a number of circular walks. For those who seek a gentle stroll without any significant ascent or descent, we recommend the Chemin des Planetes. 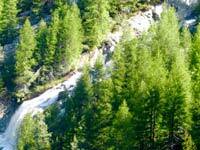 The 6.5 kilometre trail heads south from Tignousa and end about 1.5 kilometres past the Hotel Weisshorn. The walk was conceived by scientists working at the nearby François-Xavier Bagnoud Observatory. Scale models of the planets are found along the way, positioned at the appropriate scaled distance from the sun (1 metre of walking along the trail represents 1 million kilometres in space!). The walk, at an altitude of between 2200 and 2500 metres, takes about 3-4 hours. 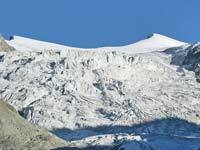 For those who seek a more substantial day out, we suggest the Bella Tola (3025 m). From Tignousa, ascend for about 30 minutes until you reach the Cabane Bella Tola (2346 m). The route—well posted throughout—then ascends gently for about 2kms (about 1 hr), until you reach the foot of the Bella Tola itself. There follows a relatively steep 55 minute climb until you hit a ridge connecting the Rothorn with the Bella Tola. After taking the right turn, the summit is 15 minutes away. The views from the top are spectacular, providing a 360 degree panorama of scores of surrounding peaks (including the 4506 m Weisshorn (pictured, from the top of Bell Tola), the fourth highest peak in Europe). Retrace your steps to descend to Tignousa, with the round-trip taking between 4.5 and 5 hours. A yet more demanding walk is Touno. From Tignousa, follow the wide track past Chalet Blanc until you reach Le Chiesso after about 30 minutes. Take the next track to the left and follow it alongside a bubbling stream until you reach Les Faches after 25 minutes or so. The route then levels out for about 50 minutes, when the path forks. Take the left hand track directly up Touno's steep slopes. You will reach the summit after just over an hour. he views are again panoramic, and come from slightly closer to the 4000 metre peaks found at the valley's end. Retrace your steps, finding time to take in the small Lac de Touno. You will return to Tignoua after around 5 to 5.5 hours. when? The walks described above are only feasible in the summer months (between May and October). The Val d'Anniviers offers the full range of winter sports. In particular, the valley offers over 220 kms of ski slopes, split between its five resorts—St Luc, Chandolin, Zinal, Grimentz and Vercorin. 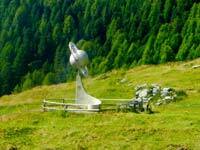 The top station is at 3025 metres, with runs dropping down to the villages at around 1500 metres. The biggest draw is probably the postcard-pretty St Luc and the nearby Chandolin, which offer access to 14 chairlift facilities, 75 kms of pistes, 2 luge runs, 35 kms of ski touring trails, and 22 kms of snowshoe trails. The nearby Zinal offers a further 70 kms of pistes, 19.5 km of cross-country skiing, a freeride area, a snowpark, an avalanche training center, and further snowshoe trails. "The skiing in this area will suit either families with young children, beginner and low intermediate adults and also those who like their off-piste untracked all week!!" Despite its increasing popularity, the Val d'Anniviers is still relatively tranquil, though this means that nightlife is limited to the regions' bars. There are a number of good traditional restaurants, supermarkets for provisions, and sports shops where equipment can be hired or bought. A further advantage is that only one skiing pass is required to use the Val d'Anniviers ski runs. when? The season starts in the middle of December and continues until the end of April each year (weather permitting). Zinal (1675m) is a mid-sized village at the southern end of the Val d'Anniviers. It is surrounded by 4000 metre peaks, making it an excellent base for both hillwalking and mountaineering. Those peaks include the mighty Weisshorn (4506m), the Bishorn (4152m), the Zinalrothorn (4221m), the Ober Gabelhorn (4063m) and the Dent Blanche (4357m, pictured). The best walk from Zinal is also the most demanding: it takes around 9 hours (though it can be shorted by about 1.5 hrs), so make sure you leave before 9am and take plenty of provisions. The walk is to the Cabane de Grand Mountet. Leave from central Zinal, and head up the valley towards the mountains. After about 20 minutes, cross the fast-flowing milky La Navisence and continue along a flat road for another 20 minutes. The ground will then start to head uphill. Take the wide track on the right hand side and follow it for about 40 minutes until you reach another bridge over the river. Cross the bridge and take the smaller track to your right. From here, the steep ascent takes around 4 hours, and contains some relatively exposed sections (so is not for the novice hillwalker). But the unfolding amphitheatre of mountains makes it worth the considerable effort. The first substantial peak to come into view is the Dent Blanche (pictured), but by the time you arrive at the Cabane (2886m) a large number of further peaks will have unveiled themselves. 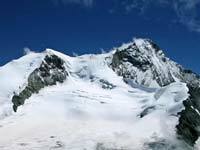 These include the Trifthorn (3728m), the Wellenkuppe (3903m), the Ober Gabelhorn (4063m), the Mont Durand (3713m), the Pte de Zinal (3783m) and the Grand Cornier (3961m). Once you have taken in the view, retrace your steps back to Zinal (about 4 hours). The Cabane (t +41 27 475 14 31) is open from the end of June to mid-September, and so is a good place to pick up provisions. Some prefer to break the walk and stay overnight at the Cabane. If the full walk is too much, you can turn around when you reach a sign saying (optimistically) that the Cabane is 30 minutes away, saving about 1.5 hrs. 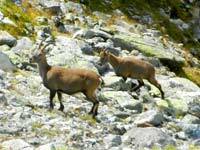 Other recommended walks in Zinal are the walk to the Cabane d'Arpitetta and the circular walk to the Roc de la Vache. £$€¥ Free. An overnight stay at the Cabane costs CHF31 (not including dinner (CHF28) or breakfast (CHF12)). The Moiry Dam is 148 metres high, 610 metres wide, and holds 78 million cubic metres of melt water from the Moiry Glacier. Built in 1958, the Moiry Dam is of an arch construction and is a major tourist attraction on account of its turquoise waters (pictured). Continue up the valley from the Dam and you will find the 5-kilometre long Moiry Glacier, complete with spectacular ice-falls, and flanked by numerous 3000+ metre peaks. The Dam and Glacier can be reached from Grimentz by post bus (with special 'hiking' services operated in the summer) or by car (there is abundant parking). The Moiry Dam (2250 metres) provides the starting point for exploring this area. From here, you can either take the pleasant 1 hour walk around the Lac de Moiry or drive to the Moiry Glacier car park (2350 metres). 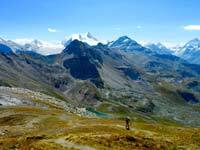 Many continue on foot to the Cabane de Moiry (2825 metres), which is manned between mid-June and mid-September, and provides refreshment and accommodation at reasonable prices. The ascent takes about 1.5 to 2 hours from the Glacier car park, and the descent about an hour. The Cabane offers fabulous views over the dazzling-white glacier's upper sections. A less strenuous alternative is to veer to the right after 30 minutes of ascent, and then walk down towards the foot of the glacier (being careful not to stray onto the glacier itself). For those looking for more of a challenge, we recommend climbing the Sasseneire (3254 metres), a four-hour ascent from the foot of the Moiry Dam (taking in a pretty alpine meadow and fairly challenging summit ridge); allow three hours for the return leg.